Why Your Business Should Have Floor Mats | Ace Uniform Services, Inc. Although you’ll be walking over the floor mats, put the advantages that come from using them at the top of your list. If you don’t currently use floor mats, you might be missing out on some of the benefits that other businesses are experiencing. Here are some reasons why your business should have floor mats. Enhancing the layout and design of your business with floor mats makes your commercial space look that much more professional. They help designate various spaces throughout your business and enhance the warmth and atmosphere. In general, high-quality floor mats will help enhance the overall experience that customers have inside your commercial space. 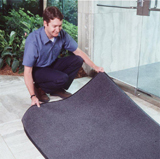 Using a floor mat at the front door gives customers, clients, and guests a consistent place to wipe their feet. It keeps people from being able to track dirt, mud, and other debris further into your business, making it look dirty and giving your employees more to clean throughout the day. Behind the counter, it also makes employees safer, especially those that work in the food-service industry. In case anyone spills beverages or other liquids, the mat will soak them up, keeping the floor dry so that no one is in danger of slipping. Floor mats give people a more comfortable place to stand. They provide cushion under the feet which takes pressure off the heels and lower back. This is especially beneficial to employees who have to stand throughout the day. It’s also a great benefit to customers who have to stand in line for fittings or other services. The floor mats create the perfect opportunity to show off your branding. Design the floor mats with your logo, company name, or even the slogan for your business. Every time people see it throughout your commercial space, it will remind them of who you are and what your business it all about. In general, floor mats are a great way to make your business and commercial space look and feel more welcoming. Because of their comfort and professional look your customers will feel encouraged to take their time and enjoy themselves more while they are purchasing your products or using your services. This entry was posted on Friday, June 1st, 2018	at 3:46 pm	. You can follow any responses to this entry through the RSS 2.0	feed. Both comments and pings are currently closed.